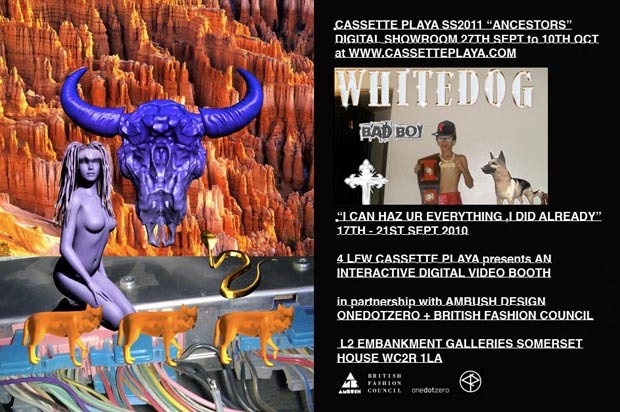 As part of the forthcoming London Fashion Week, Cassette Playa are to host a digital installation at the famous Somerset House, alongside the launch of their Spring/Summer collection for 2011. The interactive digital video booth will resemble the sorts of sticker photo booth (Purikura) found in Japan, but with a particular twist in the form of Cassette Playa CGI graphics. As always with Cassette Playa, this one is likely to mess with the established order of things somewhat, so, expect the unexpected. More information on the flyer above and from Cassette Playa.